Listen, I've been a New York Knick fan all my long-suffering life, but I never thought onetime dunk champ Kenny "Sky" Walker would ever be deemed a video game legend. But there he is, sitting on the new list of incoming all-stars that 2K Sports will be adding to their hit basketball game. 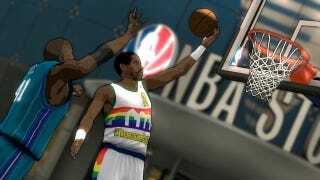 For 9.99 or 800 Microsoft points, NBA 2K12 will be offering up more than 40 players from the last 50 years of hoops history in the Legends Showcase DLC, and the athletes will be wearing period-accurate uniforms and sporting ratings that reflect their best on-court performances. Legends showcase also adds a tweak to the game's aesthetic, rendering the Times Square locale in a cel-shaded art style. The full list of Legends is below. You might not see your favorite player, but it's a good representation of classic ballers. Me, I'm waiting for Anthony Mason.